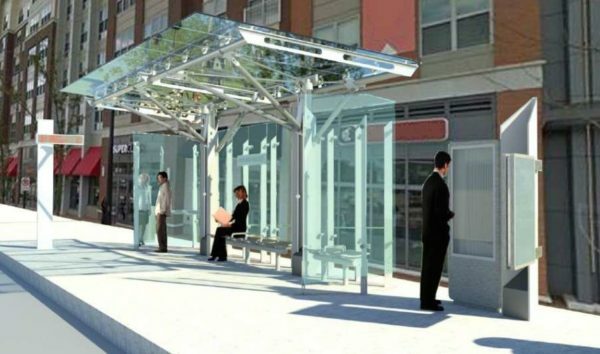 The new “Premium Transit Network” on Columbia Pike is being greeted with cautious optimism by some community members after years of discussion and delays. But some raised questions about what will mark the new bus system as “premium,” considering it will not run in dedicated lanes due to the layout of Columbia Pike and will have a fleet of standard buses, at least for now. The mood appears to be more positive than previously, when a group of civic association leaders derided the service for a lack of ambition in a letter last year. Staff explained at a work session about the network last month that the standard buses are being used for cost reasons, as electric vehicles or ones powered by alternative fuels would be too expensive at this stage. County Board vice chair Katie Cristol, a Pike resident, said that most important for the new service beyond the buses themselves will be the frequency, which she said she hopes to see at six-minute intervals for at least a large portion of the day. “I think it’ll be more incremental, but I do think once the system is operational and its component pieces are in place, Pike residents will feel something different, we’ll experience something different,” she said. Residents did give staff credit for looking at ways to keep costs down when constructing the 23 “premium transit stations” along the Pike. The successor to the nixed $1 million “Super Stop,” the new stations will be factory assembled to save money, and include features like electronic arrival boards and the option to pay a fare before getting on the bus. However, some questioned the need for the technology in the bus stops, given the proliferation of smartphones and bus tracking apps. With the new network set to begin operations next summer, Cristol said she hoped it would help spark more economic development and revitalization along the Pike, as businesses look to capitalize on more regular service. Cecilia Cassidy, executive director of the Columbia Pike Revitalization Organization, did not respond to requests for comment. But Birch said he would like to go further, and see long-term planning for Columbia Pike include a long-range goal of an elevated light rail system, as well as maintaining good bus service. Durgan said plenty of people were “totally bummed” when the streetcar project was cancelled in 2014, as it would have been something different for the Pike.